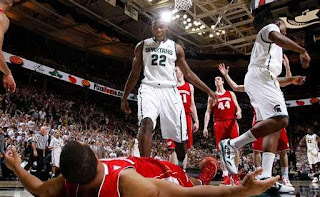 Just another Michigan State-Wisconsin game where the winner doesn't hit 50. The game was filled with great defensive plays and horrid shooting but, nonetheless, the Spartans became the second team to win at Wisconsin when held to fewer than 60 points (Badgers are now 119-2 in those games). Branden Dawson came to play and was spectacular defensively. Even freshmen Gary Harris looked wise beyond his years defensively. Both played a major role in holding Wisconsin to 8-for-27 shooting from 3-point range.